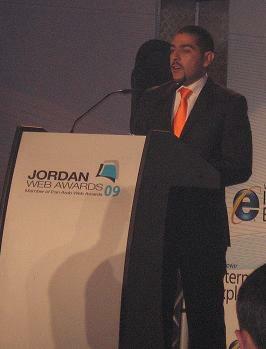 In a fogy atmosphere that is saturated with cigarettes smoke, Jordan Web Awards were distributed last Saturday in Hyatt. Being an anti-smoking fanatic, I have to say it was not a pleasant experience. In three hours, I believe that I inhaled an amount of cigarettes smoke that superseded the amount I inhaled in the last five or maybe ten years. In addition to smoking, and with all respect to the audience, I believe that the audience lacked the courtesy to listen to the emcee and the key speakers, to that some speakers were not able to hide their resentment. On the organization level, I have to admit that a respectful amount of efforts have been put together to make this event happen. However, I believe that there were things that could have been done differently, and could have contributed in the success of the event. Take for example the judges panel, which was timidly introduced. The judges should have been called to the stage and they should have highlighted the main points they considered in their evaluation and how points have been calculated. Also, sites were spread very thin under categories. The number of sites competing under each category was six at most . Taking the volume of participated sites, I believe categories should not have been more than ten. It was also obvious that a lot of names in web development in Jordan were not attending like Maktoob, Ikbis, D1G, ShoFeeTV…..etc. On the bright side, Bayt.com won the golden award for online services category, and proudly I was nominated by my colleagues to pick up the trophy and to deliver a small winning speech. Congratulations Bayt and always for the best.